Remember two posts ago I said that most movie remake of anime series are really just the last attempt to squeeze of the franchise? 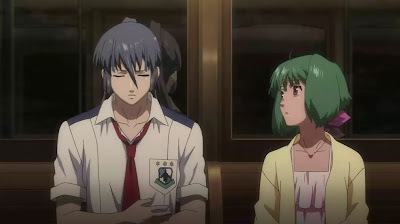 Well, in my opinion, this is exactly what Macross Frontier: Itsuwari no Utahime is. It's literally the cut-and-pasted replay of the entire TV series with some plot point changes that is convenient for fitting the entire story into a shorter plot. This modified story, I have to say, makes a lot less, yes LESS, sense than the original story. Some parts of the story, especially those towards the end, are just plain silly and laughable. Even though they're in the similar situation of shrinking a full long season into a less than two hour long movie, unlike Fate / Stay Night: Unlimited Blade Works, this movie slows down quite a bit in the middle. Generally, a slow part in the movie would allow the story to insert some background explanation on certain to make the plot clearer. In this case, however, most of them feels they're dragging too much unnecessarily. Maybe it's a certain atmosphere they were trying to set, but I don't think it's very effective. One other thing, somehow I didn't notice it last time around, due to either ignorance or the fact they didn't literally have the Lombard Street or Golden Gate Bridge in the TV series (or did they? I don't remember at all), the Macross Frontier city is completely, I mean completely, modeled after San Francisco. Recommendation: Honestly, I wish they haven't made this movie--the end of the TV series is already a bit of a stretch when they're trying to go over the top with hyped up excitement, the plot of this movie is worst. In fact, I'd describe the plot for the second half of the movie to be completely out of whack--you literally have to turn your brain off to be able to withstand the bombardment of some most laughable idiotic ideas they're trying to pitch at you. If you liked Macross Frontier TV series, I would actually recommend against on watching this movie. Yes, it is that bad.